Great Plains Tribal Chairmen’s Health Board is joining the American Cancer Society in this year’s Great American Smokeout on November 16, 2017. This Challenge is open to all the Tribes of the Great Plains (SD, ND, NE, IA). 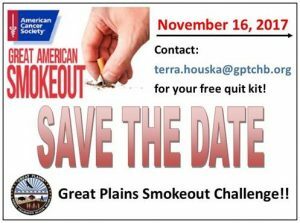 Please contact Terra Houska for more information and your free quit kit! Prizes for those who stay smoke free for 30 consecutive days. 43.8% of American Indian/Alaska Native (AI/AN) adults reported current use of commercial tobacco in 2013. Cardiovascular disease is the leading cause of death among AI/AN. Lung cancer is the leading cause of cancer deaths among AI/AN. Smokers are at a higher risk of developing diabetes. 400,000 deaths in a year are attributed to smoking. One pack a day for an entire year is the same amount as a trip for one person to go to Disney World! Smoking-related illness costs more than $300 billion each year. Direct medical care for adults costs $170 billion each year. $5.6 billion in lost time at work due to secondhand smoke exposure. Smokers hike up the cost of insurance premiums that effect all non-smokers.